First published in 1777 by the philanthropist John Howard (1726-90), this work was intended for as wide a readership as possible. 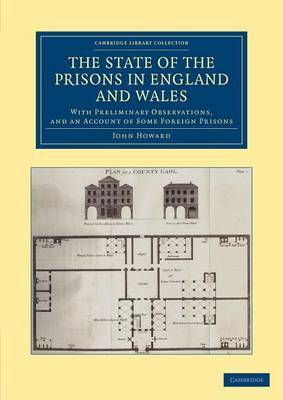 Based on research from more than 300 visits to at least 230 different penal institutions on his extensive travels around Great Britain, Ireland and continental Europe, The State of the Prisons was a vital early contribution to the cause of penal reform. It provided, for the first time, systematic evidence of poor management and degrading conditions in institutions at home and abroad. Although Howard saw only limited changes to prisons in his lifetime, his labours formed a crucial platform for subsequent movements, notably the Howard League for Penal Reform, founded in 1866. This reissue incorporates a substantial appendix, compiled in 1784, which presents updated findings from further visits to British institutions as well as those in Germany, France, Italy, Flanders and Scandinavia, among many other places.